We're excited to announce the much anticipated arrival of Clara and Rowdy's babies born Monday August 14, 2017. Clara gave birth to 1 beautiful Salt and Pepper girl and 1 handsome Black and Silver boy. I'll be taking deposits on these babies in order to reserve them until they are ready to go to they're new homes at 8 weeks old on Monday October 9, 2017. The deposit is $200 per puppy, all deposits go toward the purchase price of $750. 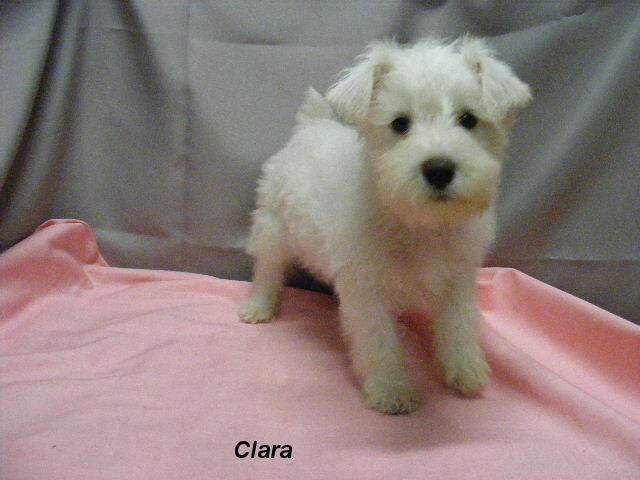 Clara is a solid white colored AKC Min Schnauzer, she weighs 12 pounds and stands 11 inches at the shoulders. 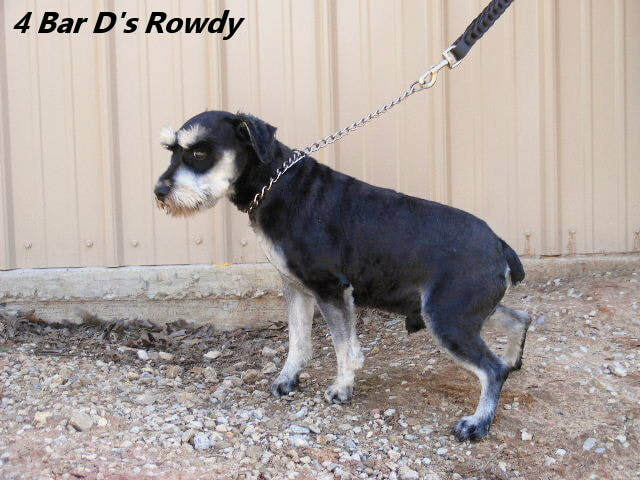 Rowdy is a dark Black and Silver in color and weighs 17 pounds, he stands 13 inches at the shoulders. These babies will not be the smaller Min Schnauzers, but more of the standard sized Min Schnauzers weighing 12-18 pounds as adults. They come with full AKC puppy registrations papers, our 1 year Health Guarantee, micro chipped, Health Records, current puppy vaccinations and current de-wormings starting at 2 weeks old. They also come with a Puppy Starter Kit containing a new collar, a new toy, a baggy of puppy food and a Life Time of Breeder Support. These puppies will have had their dew claws removed and their tails have been docked. We do not crop the ears on our puppies, we leave them natural. If you wish to have your puppy's ears cropped you will have to see your Vet about that after you get your puppy home. We expect these babies to have the same out-going and affectionate personalities as their parents. We can arrange transportation for your puppy, contact Scott for details! We are required by the State of Oklahoma to have your puppy micro-chipped and is included in the purchase price. You can opt out of having your puppy micro chipped for religious reasons, ask for details.